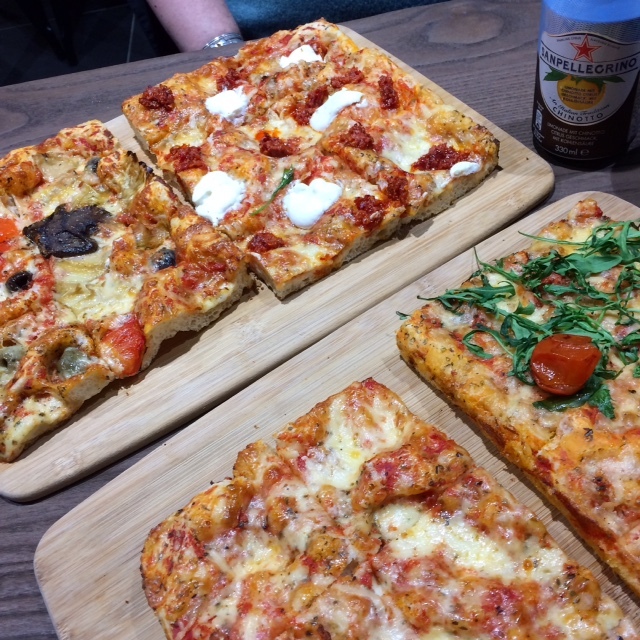 On our first visit to Signorelli’s Deli, it was definitely a case of “eyes bigger than the stomach” as Paulo and I struggled to choose from the variety of mouth-watering pizzas on display. 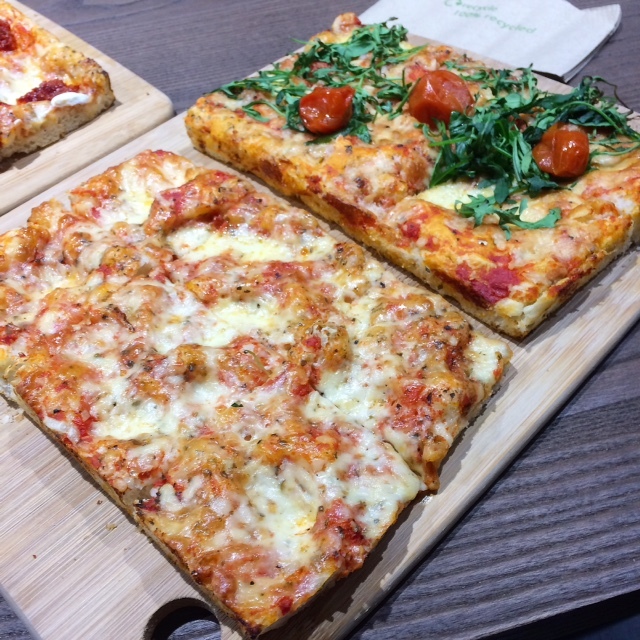 One slice of pizza al taglio is enough for one person, but no… we had to have two each! The advantage is that we got to taste a variety of tasty toppings. The disadvantage is that we were way too full to try any of their range of sweet treats, even though they come in small portions. They were six types of pizza available that day (we didn’t try the pizza topped with potatoes and the other with speck and walnuts). 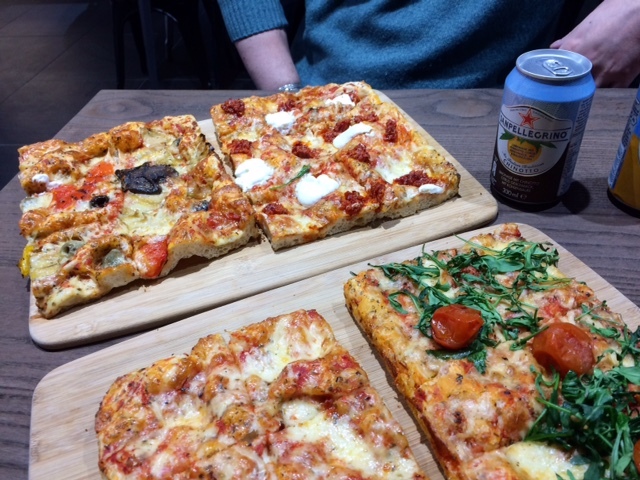 We shared four types of different pizzas with the following toppings: tomato sauce & cheese (the margherita), roasted cherry tomatoes & rocket, ‘nduja (spicy pork paste originating in Calabria) & fresh mozzarella and the vegetarian. Every single one was delicious but I particularly liked the pizza topped with roasted veggies (mushrooms, red & yellow peppers, artichokes and black olives) and creamy, melty cheese. 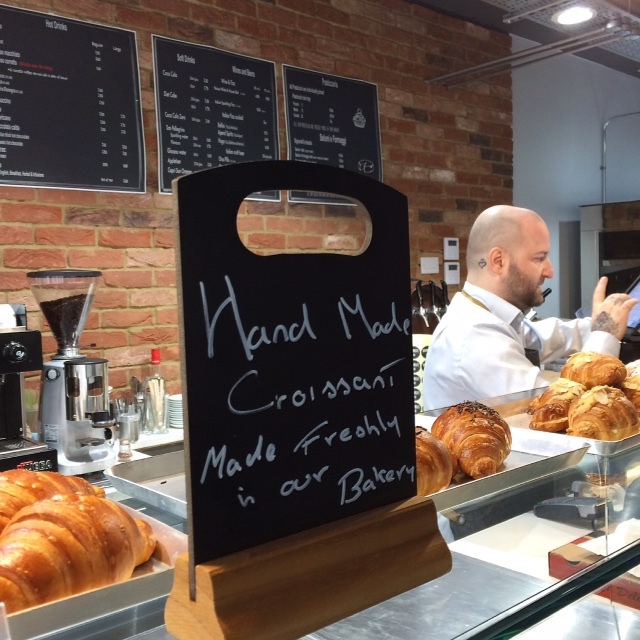 Signorelli’s Deli have a wonderful selection of croissants and other sweet treats, all freshly made in their in-house bakery every day. 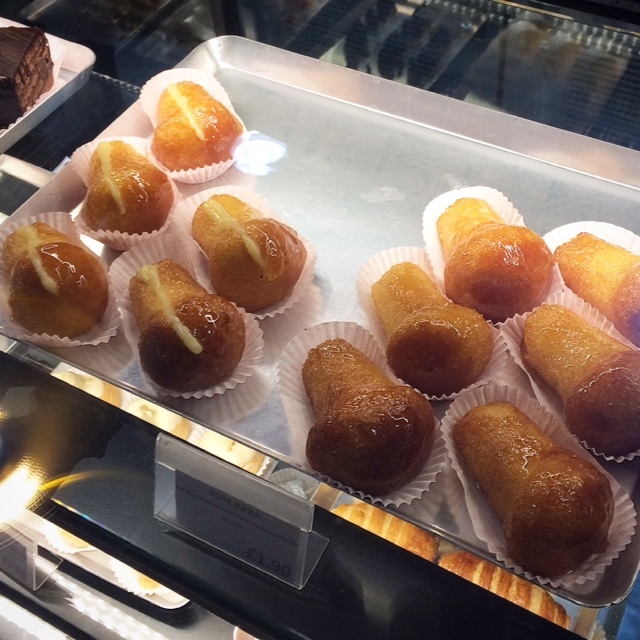 The sweet treats are called pasticcini, meaning bite sized pastries. It’s nice that the portions are small, just a little something to have with a hot drink or as dessert after a slice of pizza. So we missed out on the sweet treats this time but I know several people who raved about them, particularly the baba. 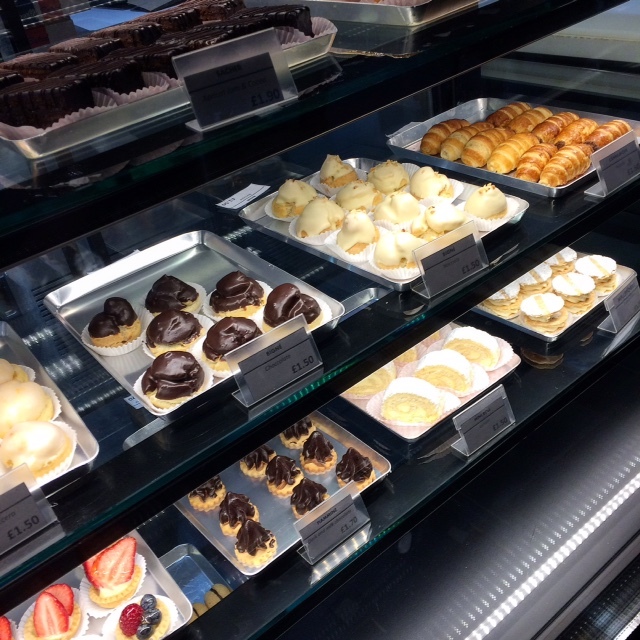 I’ll be making many return visits to Signorelli’s Deli to indulge my sweet tooth. 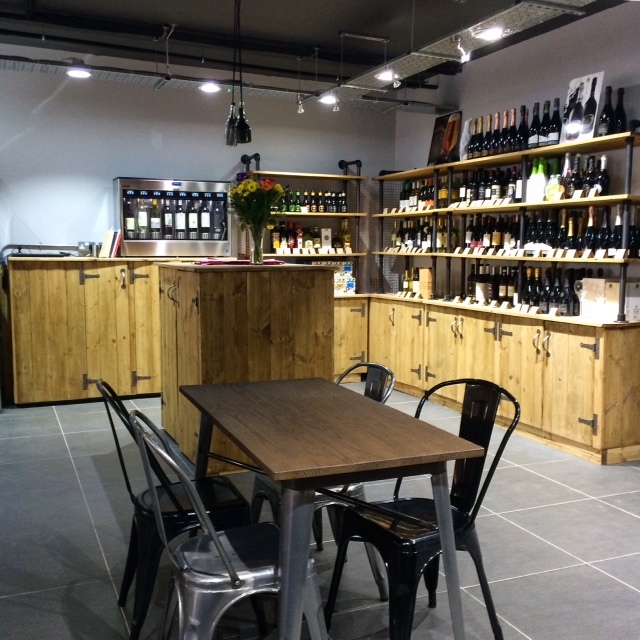 There is also a space in the corner that serves as a shop selling bottles of wine, fizz and other drinks. 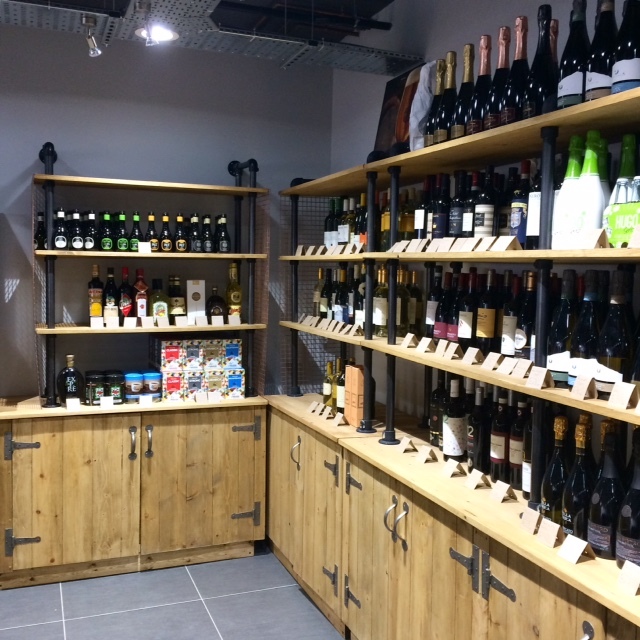 Owner Alex Signorelli also runs Simavin Ltd, an importer of quality sparkling wines so he’s well placed to stock the shop. The space also doubles as a charming aperitivo bar, where customers can enjoy happy hour from 4pm to 6pm, Mondays to Saturdays. 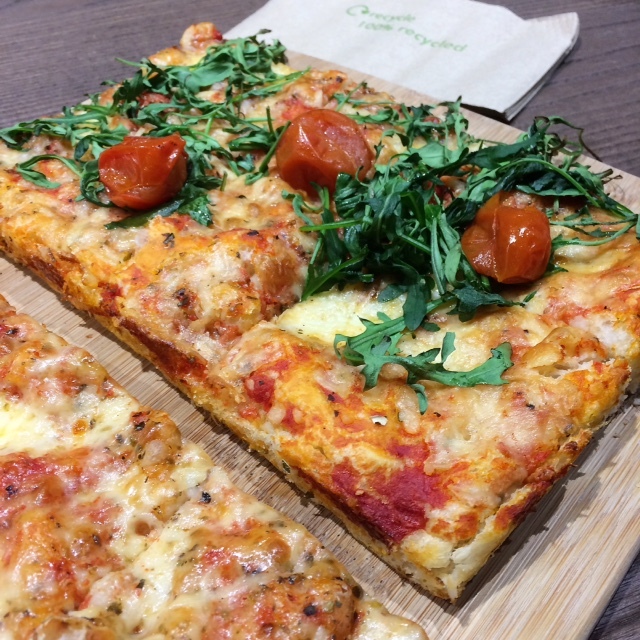 I know I’ll be going back for a slice of pizza and a refreshing Aperol Spritz! 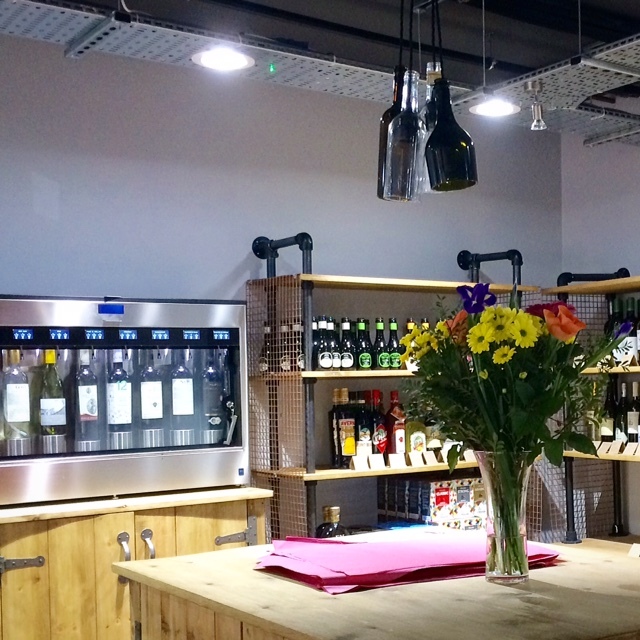 There is also a wine dispenser with a nice selection of wines available by the glass, all reasonably priced. 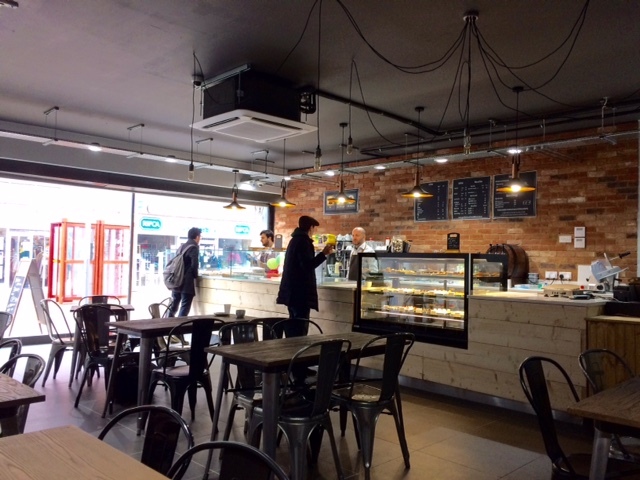 Signorelli’s Deli is a little corner of Italy in Cambridge with great food, drinks and people. 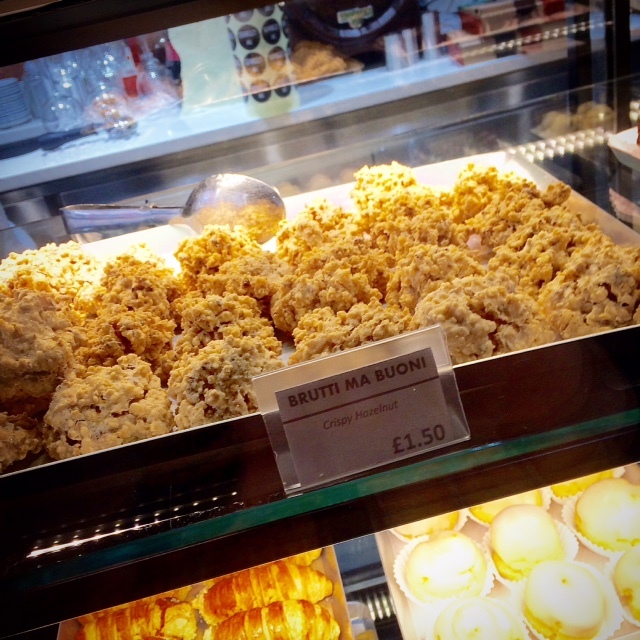 Walk in, feast your eyes on all the Italian delights and order at the counter. The friendly, relaxed ambience and delicious food will have you popping in time and again. 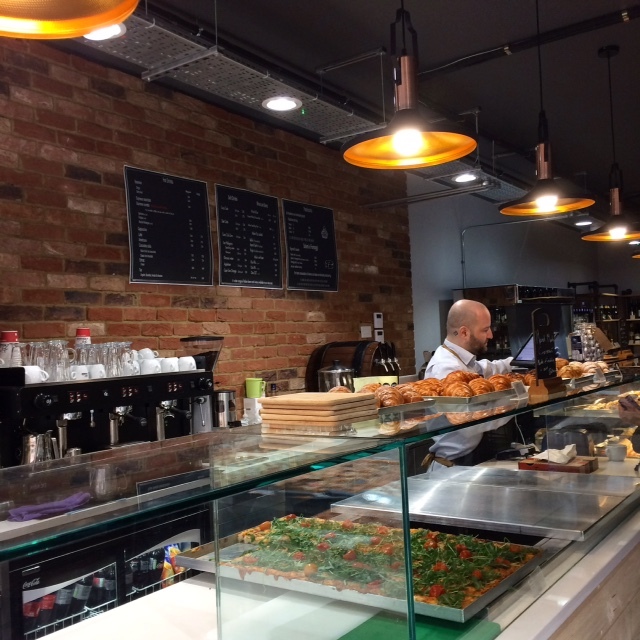 In closing, here are some little known facts: Signorelli’s Deli is the brainchild of Alex Signorelli, a resident of nearby Hertfordshire who hails from Bergamo in northern Italy. A little research on the ‘net (it helps that I understand Italian) revealed that the creation of this deli in our little city was big news in Bergamo. 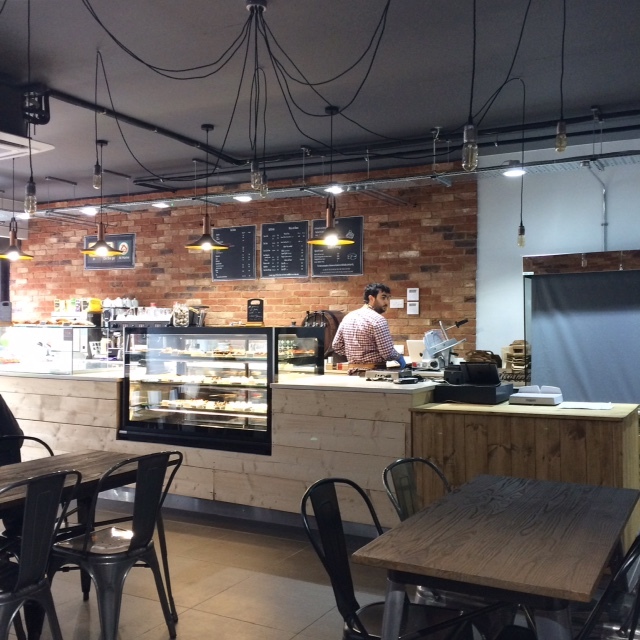 Alex put a call out in the media to assemble a team of Bergamese experts, including a baker and pastry chef, to help get the Cambridge deli up and running. One of the team members recruited, manager Marco Pirovano, is somewhat of a celebrity in Italy. This friendly chap with the amazing tattoos was a successful applicant in Italy’s version of Dragon’s Den – called Shark Tank – with his PolentOne enterprise, a range of little shops and three-wheeled vehicles serving polenta, now operating in various Italian cities as well as Barcelona and Berlin. Now wouldn’t it be great if we could get some of that here in Cambridge? 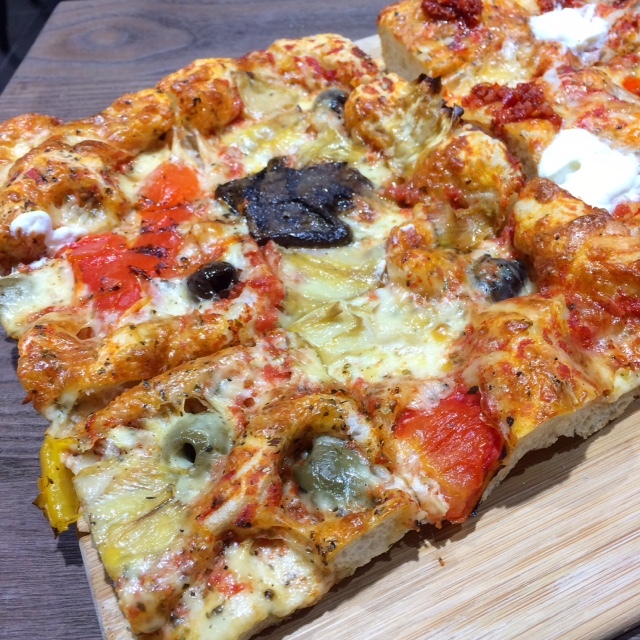 This entry was posted in Restaurants and tagged Alex Signorelli, Cambridge, Cambridgeshire, Italian Fizz, Marco Pirovano, pizza, pizza al taglio, PolentOne, Shark Tank, Signorelli's Deli, Simavin by One Two Culinary Stew. Bookmark the permalink. Sounds great, will deffo pop in next time in Cambridge.